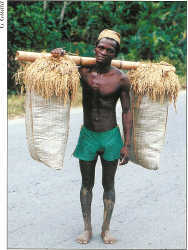 A farmer in Madagascar carries rice using a bamboo yoke. Ever since an early mentor of mine handed me, an over-enthusiastic fifteen year old, a grass and said “this is the most difficult group of plants to know: if you can figure this out, you can do anything,” I have been fascinated with grasses. After several hours of looking up parts of the language that only grasses use (glumes, lemma, lodicules, awns etc. ), I figured out what he had given me. It was a wild relative of rice. I still have that specimen. Rice is a grass, as are maize (corn), wheat, barley, millet, oats, sugar cane, sorghum, rye and bamboo. Remember that most livestock eat primarily grass or grass products so, indirectly, leather, wool, meat, eggs and milk also come from grass. 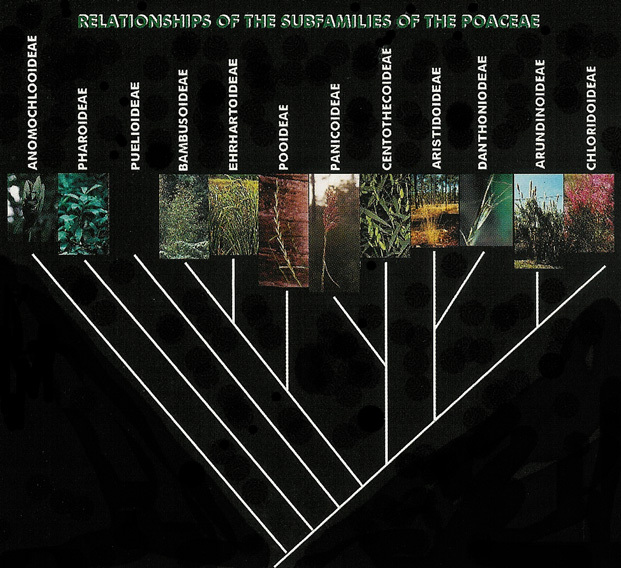 The grass family, known scientifically as the Poaceae or Gramineae (both names are correct), is one of the four largest families of flowering plants, with approximately 500 genera and 10,000 species. Grasses range from tiny inconspicuous herbs less than an inch high to the giant bamboos that grow to 130 feet tall. The family is undoubtedly the most important flowering plant family to humans, directly or indirectly providing more than 3/4 of our food. It also is a major producer of our oxygen and provides a large component of the earth's environmental illtering processes due to its enormous geographic range, spatial coverage and biomass. The economic importance of grasses can hardly be overstated. The latest edition of Agnes Chase's First Book of Grasses tells us that grasses are the greatest single source of wealth in the world. They provide much of the starch (rice, cornmeal, bread, cereal, pasta) and much of the protein in most human diets. Although a few grasses absorb selenium and other harmful substances from the soil and a few others have potentially poisonous cyanogenic compounds in their shoots and leaves, the overwhelming majority are not poisonous. The grains are naturally low in fat and rich in complex carbohydrates. Grasses sweeten what you drink and eat with cane sugar, molasses and high fructose corn syrup. Corn by-products also provide the raw material for many chemicals used in industry. Grasses provide the raw material for most alcohol products (sake from rice, rum from sugar cane, beer from barley, bourbon from corn, and whiskeys and other spirits from wheat and rye). Although bamboo shoots are enormously important as a food crop in Asia, the real economic contribution of the bamboos is as a building material and a raw material for paper and furniture. More than 3,000 uses have been listed for bamboos in Japan alone. There is even a bamboo culture in Honduras which is based on the giant Guadua bamboo which we have in the Garden. Of course, because corn and rice are the staple foods of many of the world's people, cultures can be defined by them as well. Rice is a sacred plant in many Asian cultures with some 21,000 recognized breeding lineages. In contrast to the enormous economic benefit of grasses, it must also be noted that a large percentage of the world's worst weeds are in this group as well; and they cost millions of dollars every year to manage. Cogon grass and Bermuda grass, the world's most common grasses, are also two of the world's worst weeds. You need only look in any vacant lot or roadside in Miami to see some of our most prolific weedy grasses (Neyraudia reyanudiana, Pennisetum putpureum and Panicum maximum) dominating the landscape. Grasses aren't just in your back yard, they are more geographically distributed than any other family of flowering plants. The southernmost recorded flowering plant is the Antarctic hair grass, Deschampsia antarctica E. Desv., and several species of grasses are among the most northern growing tundra plants as well. They are very common in alpine areas and lowlands, in swamps and in some deserts. When forest is cleared, grasses usually dominate the landscape. They bind the soil and prevent loss of topsoil all over the world. Taken together, they cover more area on earth than any other flowering plant family. They are the dominant plant in the savannas that ring the earth at the boundaries of the tropics and they dominate the boreal steppe (cold temperate grasslands) and the prairies of North America. Tropical savannas currently cover about 20% of the earth's land surface, grass dominated areas in general may cover as much as half. Dominance of grasses in these habitats is usually maintained because there is not enough water for trees to survive, there is heavy grazing pressure, or because fire occurs frequently enough to keep the trees out. Grasses adapted to fire prone areas have their growing tip either below ground or well protected within a tight clump of leaf bases. When they burn, only the leaves or the odd flower stalk are lost. The growing tip stays insulated and safe. Grasses are also generally fast growers. A bamboo has been measured growing 47.5 inches in 24 hours. Some grasses are actually stimulated to grow by grazing. The huge herds of more than a hundred different grazing animals in Africa, bison on the great plains of the USA, cattle all over the world and billions of termites on the savannas of South America are all supported by grass. There are two major photosynthetic pathways in grasses, C3 and C4. With the exception of the bamboos which are all C3 and are common in the tropics, the relative percentages of C4 and C3 grasses reverse each other between the tropics and the poles with almost all grasses at high latitudes being C3 and most of those at the equator being C4. In general, C4 grasses are more efficient and can work at higher temperatures and light levels than C3 grasses but they need higher temperatures and/or light levels to begin photosynthesizing. The Garden has representatives of most of the major groups of grasses, including a few that are not in any other botanical gardens in the western hemisphere and at least one bamboo that is not in any other botanical garden. I co-authored a new classification of grasses (shown above) that has just come out in the Annals of the Missouri Botanical Garden. Several mysteries of grass relationships were solved in that paper, but many more remain to be solved. I'll be busy for a long time to come on my favorite family - the one that we all rely on.